WALKSTRONG ~ www.walkstrong.ca: "I Was Meant For The Stage ..."
"I Was Meant For The Stage ..."
Over this past weekend, Russell and I has the opportunity to play at the Jack Singer Concert Hall in Calgary. Definitely a dream come true. This facility hosts many great acts, plays and performances year round. 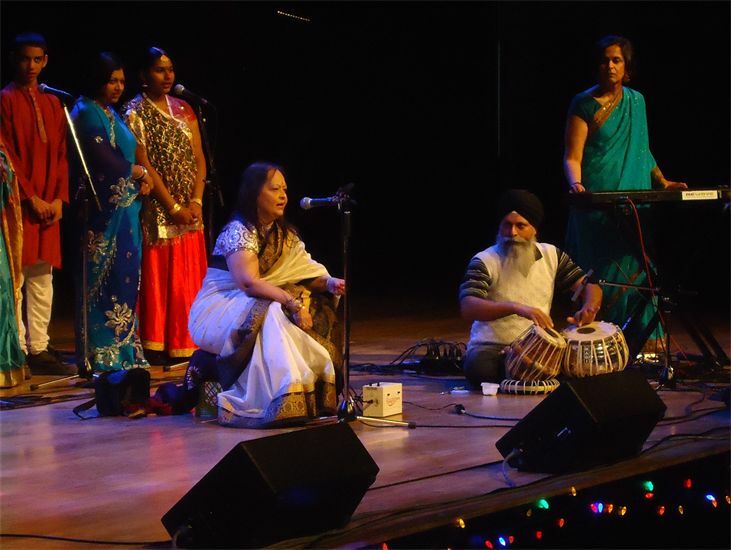 As mentioned in a previous blog post, the east indian community held a cultural event, Diwali, and this year, we were one of many acts playing at the event. Differing from our usual band sound, we played with an author and classically trained singer, Mrs. Jayshree Bhatt. 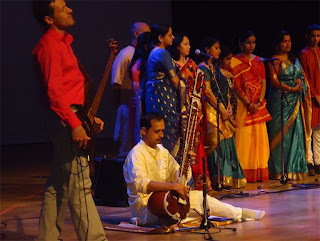 Our item included Russell on bass, myself on keyboard, Harjitbhai on tablas, Vineet on sitar and a choir of 12. Mrs. Bhatt chose 4 religious ragas to celebrate Diwali. With the purity of her voice, the trance-like tabla sound, the angelic choir and our non-ethnic feel on bass and keyboard, we delighted the crowd with four songs. In between all this excitement, I had to carry around my juices, meds and potatoes to make sure I was on schedule. Some spoke quietly to each other as they curiously wondered what "drugs" I was ingesting prior to performing ... I felt like a bit of a druggie, getting "ready" to perform. And to my surprise, it made me laugh thinking ... hmmm what are they thinking. As well, I had a few people who "know" about my diagnosis, and I know they know, but they don't know I know they know ... whatever, anyhow these few looked shocked that I was walking, talking and even performing on stage. In their minds, cancer means weak, frail, and dying ... and in their defence, that is probably their experience with family and friends. They were greeting me, cautiously, probably not sure what or how the conversation would go. For me, it was life as usual. I was more worried about my performance and my indian sari falling off then the impression I was making to the casual few. At that moment, I really didn't bother with what others thought, and it was liberating. My parents said to me a few nights earlier, that they were proud of me, where I was, and what I had become. What I represented and knew that I was beating this horrid dis-ease with a great deal of class. I guess I had what I needed to be "seen in public". I had myself, my own sense of who I am. I wasn't there to impress anyone but ... me. And I did. And it was awesome. Once again, I had Russell on stage, beaming and glowing in the moment. And every time I looked in his direction, his smiling face made me laugh. He was meant to be on stage. His emitted his passion and true love for music and it was contagious. Another moment of feeling I was exactly where I was suppose to be in my life ... and loving every musical moment. What an amazing experience all around! Must be great to get out there and have a normal night - what a task to move Gerson on the road for a day. So happy that you're so happy, and doing so well. Being able to pour yourself into your music must be a wonderful outlet. Yes, it is great to be performing, that is one constant during the journey for us, and I am SO thankful for it. I LOVE playing music with Russ and our band, a great way to connect and definitely music therapy!! "Tea In The Sahara ..."
"Two Kinds of People ..."
"Here I Go Again ..."
"Make That Connection ... "